Do you want to open for Hot Chelle Rae? Haven't you always wanted to perform at Six Flags? Maybe your dream is to open up for emo rockers Hot Chelle Rae. Well, now you have your chance to do both in one fowl swoop. 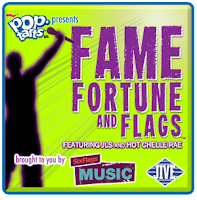 Submit your music video at sixflags.com before July 15, and you have the chance to open for JLS and Hot Chelle Rae at one of the dates below. One grand prize winner will even have a song and music video recorded by Jive Records. Now that seems like a good deal.